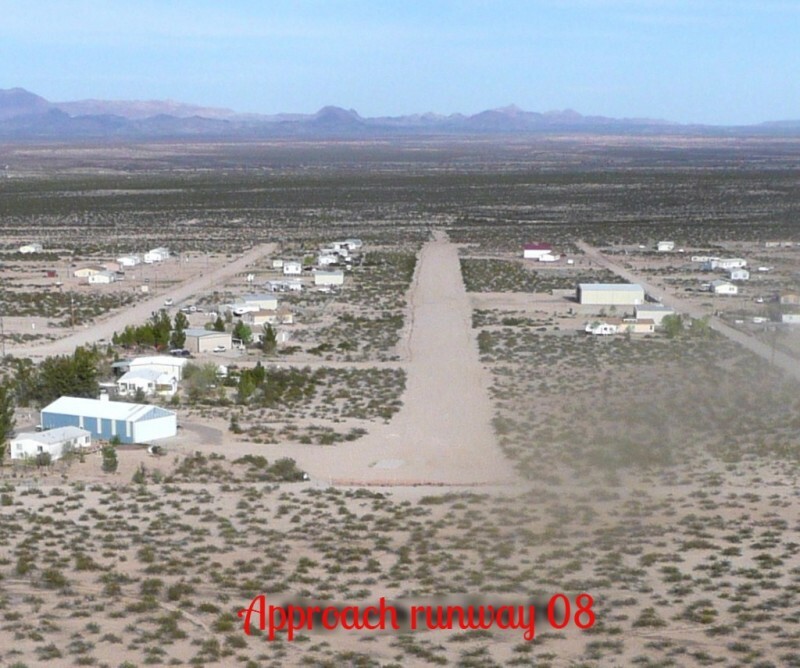 High Mesa Airpark, 3AZ8, is situated approximately eight miles southeast of Safford Arizona in Graham county. Total area of the airpark is 50 + acres consisting of nineteen individual parcels and and additional eleven+ acres to the west of the runway with future developement potential. The airpark was established in 1997 with sixteen 2.5 acre lots, eight on each side of the runway, with the additional 11 + acres to the west not having direct access to the runway. 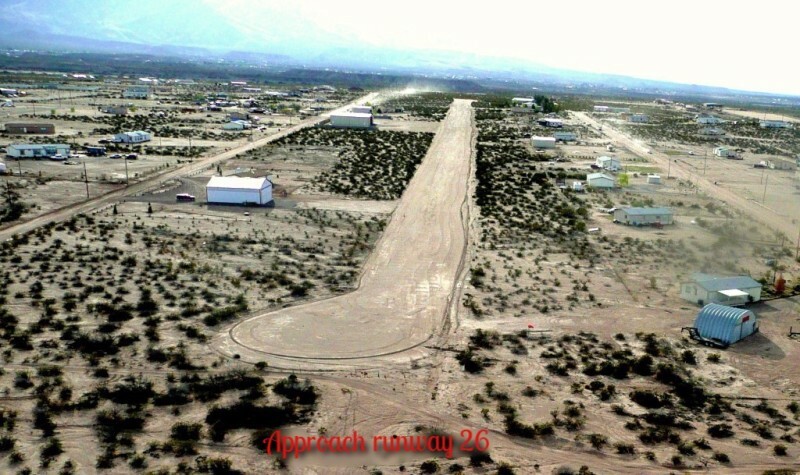 The 3300 ft. long east/west 60 ft. wide dirt runway (08/26, elev. 3080') was set between Emory Rd. to the north, and High Mesa Rd. to the south. Those two streets dead end at federal BLM property to the east, precluding any further development in that direction. Traffic to and from the area must use Barney Lane, a north/south county road with access to both Emory Rd. and High Mesa Rd. and connections to both state highways 191 and US 70. There is a "Green Zone" extending out 150 feet each way from the runway centerline so that each lot in the airpark is restricted from erecting any vertical construction in the "Green Zone". 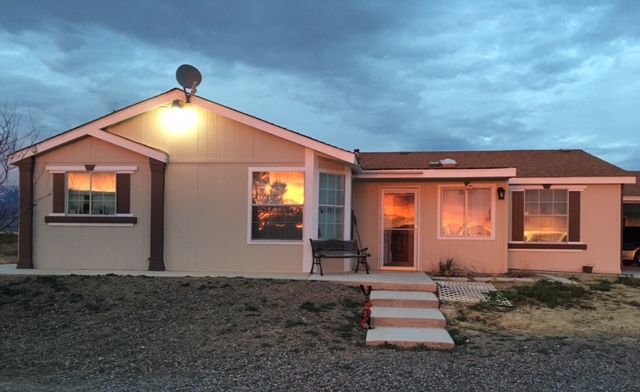 Several years ago four of the original 2.5 acre lots were subdivided into six smaller lots and gifted to the owners family, so that there are now some non-aviation oriented property owners on the airpark. This website of our HOA is an effort to share the overall experience of airpark living with anyone who is not familiar with the lifestyle that is inherent when you can drink your morning coffee and then step outside to your hanger and open the big door, taxi out and go flying. There are no real estate brokers or salesmen living on the airpark, but those lots for sale owned by HOA members who are in good standing are listed elsewhere in this site and may be contacted directly. 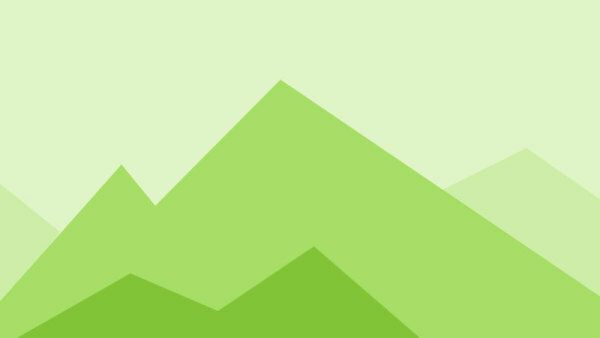 ​HOA dues are only $150.00 annually and the CC&R's are located on the properties for sale page. The Safford, AZ area is in Graham County and is adjacent to the city of Thatcher and it is difficult to know when you pass from one to the other. The population of Safford in 2010 was 9566 and Thatcher contained 4022 souls. The major retail stores in the area are Wal-Mart and Home Depot with Safeway and Bashas' the largest grocery stores. There are several auto dealerships and fast-food chain outlets and other amenities as found in most towns of this size. Tucson, AZ to the west- southwest is the nearest large city, about 2 hours driving time. Phoenix is to the west northwest about 3.5 hours away. (Approximately 165 miles). Mount Graham, with it's peak at 10,720 feet , is the home of the worlds largest binocular telescope and is immediatly west of High Mesa Airpark. Thatcher is also home to Eastern Arizona College, a junior college where Arizona resident senior citizens pay no tution to attend classes. (You almost can't afford NOT to go). The college fields teams in all major sports. Thatcher also has an 18 hole golf course. There is a full-service hospital in Safford ( Mount Graham Regional Medical Ctr.) and several different medical specialists fly in weekly or bi-weekly or monthly from Tucson or Phoenix. ​It used to be that cotton, copper, and cattle were the backbone of industry in the area, but there doesn't seem to be much action in the cattle portion anymore.